Prior's Field House Drama Competition. Monday saw some serious showcasing of one of our greatest authors Roald Dahl, when the battle of House Drama took place. 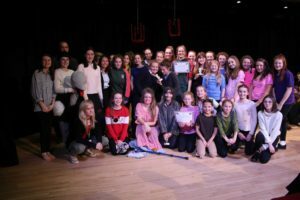 Amongst the foxes, talking insects, a giant peach and a couple of twits our judges witnessed outstanding performances from the Lower School girls that Upper School students expertly directed. Pankhurst wiped the stage with a total of 6 awards including Overall Performance, Third Formers Jess and Millie won Best Actor for their revolting Mr and Mrs Twit and Best Director went to Fifth Formers Cat, Lucy, Maya and Olivia. Frank picked up Best Costume and Props for their clever interpretation of Fantastic Mr Fox and First Former Natasha won Best Newcomer. Austen collected PF Oscars for Technical and Best Programme. All things Music: Prior's Field House Choir and House Music Competition.